Does it do what it says on the tin? And what about the important feature not on the datasheet? The Enphase AC Battery seems to work with precision that other available offerings cannot match, giving very good results per kWh of storage, especially in winter. Installation was quick and good, seems to manage small loads as promised, Web interface is clear, data is locally accessible to automated tools, expensive by the kWh. Bought from Eco Partners for £2995 including installation and VAT (and continuing on-line services). 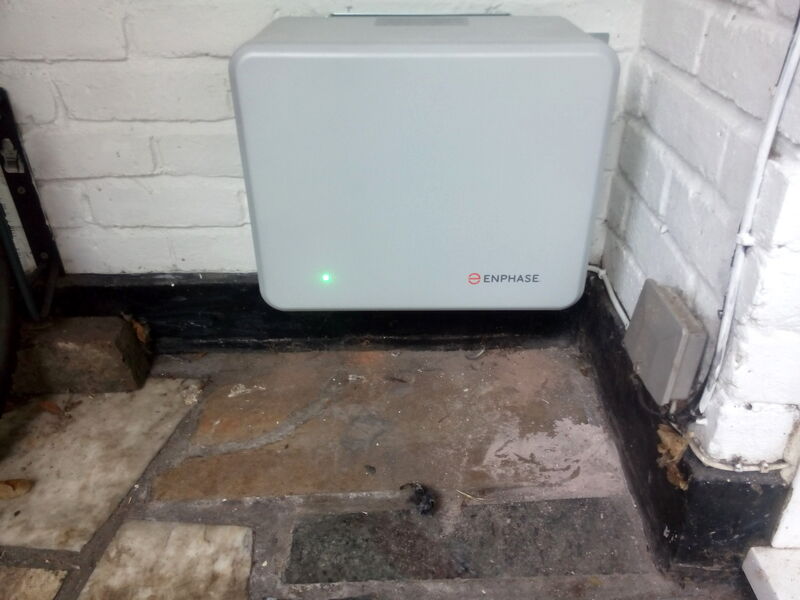 The Enphase AC Battery is rated at ~1.1kWh usable capacity (reports 1240Wh at full, 0Wh at empty, as of 2018/08), ~260W maximum charge/discharge power, and the key undocumented minimum supported (ie trigger) load (so maximum 'leakage' import) of 5--15W, which is important where typical loads are small, eg overnight. (Best alternative known is Sonnen 8 or 9 at ~30W; 240W not untypical.) LiFePO4 (lithium iron phosphate) / LFP (lithium ferrophosphate) chemistry AKA the non-exploding but slightly heavier type of lithium battery. Size is 390 mm (W) x 325 mm (H) x 220 mm (D) without bracket. 25kg for the battery itself. A modular system allowing multiple battery packs to be added as needed, though would be bulky and expensive to cover typical household spiky loads such as washing machine (~2kW) or kettle (~3kW). A single "Envoy-S Metered" has to be installed to manage one or more Battery units. The Envoy is small and acts as a hub to connect to the Internet and even serve stats locally. Security might be enhanced if Internet connectivity could be dropped entirely unless required. Envoy can accept details of local time-of-use static tariffs to optimise savings, but apparently not dynamic inputs or my algorithms using data accessible within the Envoy, to improve scheduling and system value. On 2018/07/18 I put the deposit down for an installation of a single Enphase AC Battery (1.2kWh) plus "Envoy-S Metered" hub. Installation is due early August. So there is stock, and lead-times are refreshingly short. Note that this hardware and installation comes in at £2995 including VAT. Additional batteries ordered at the time would be ~£1500 each, so giving a cost of about £1500 to £3000 per installed kWh with surrounding system. 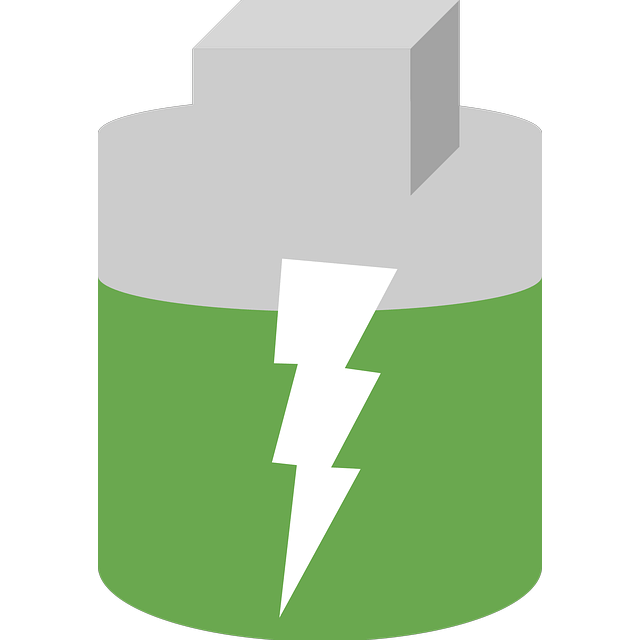 Both the management of the lithium-format batteries and the grid interaction are complex. The claimed low minimum cut-in/import value is key to my purchase; it's really not made clear in the spec sheet. I'm concerned about finding somewhere suitable to support 25kg+ of battery. My meter box has been left with long tails for years to enable this sort of fitting, but it ain't pretty and it ain't spacious! Getting stuff looking tidy is possibly beyond me: I'd rather someone else sweated it! Compare that with the 400Ah@12V of lead-acid gel batteries that on 2011/01/10 cost me £900 including VAT and delivery, ie close to £400 per usable kWh of raw storage. So even though raw wholesale lithium batteries should be able to beat those (old) lead-acid prices by a fair margin, that's not visible at retail at all. The lithium-format batteries will have a longer life and can be pushed harder than the lead-acid. I'm aiming to allow up to four battery units to be fitted eventually. The aim of this unit is to absorb background low loads such as fridge/freezer and lighting overnight. For that it is important the precision with which the system can prevent imports from the grid, and the minimum such load that it can handle. That rather important piece of information is not in any of the spec sheets other than for the Powerflow Sundial M2/S2 for which it is ~150W. Too high to kick in and handle our typical ~70W fridge/freezer load. The Sonnen UK technical director confirmed in email a cut-in figure of ~30W for the Sonnen 8.0 and Sonnen 9.43. In discussions, ecopartnersuk.com suggested that the Enphase AC Battery is capable of something the 1W to 5W range, for charge and discharge. That seems plausible as the charge/discharge power per ~1kWh battery unit is ~250W maximum. Substantially on the basis of this claim I have ordered the Enphase from them to use as a testbed. The Eco Partners crew arrived in their van ~14:30. I'm happy to say that the Enphase guys are cheerfully and professionally coping with the complexity of my system, and my awkward small space. They have done a nice neat job siting the Envoy-S (not enclosed in any outer box) between the consumer unit and the meter box, with a plain white domestic-friendly isolator switch. By 16:15 the backing plate up for battery was up, Envoy-S was up, and largely plumbed in to power, CTs, etc. Wire run for battery is not yet done. By ~17:45 everything installed, wired up and commissioned; battery charging! All round a tidy professional job by a pleasant and helpful crew. The balance of the fee was taken on my card just before they left. I was asked some details to get my on-line account set up, including the schematic, and the direction(s) and inclination of my panels. I can expect to get access to the on-line account in a couple of days, but it is gathering data in the interim, I am told. The battery has a little charge (~25% as shipped, some from my PV). The sun is going down so generation is ~500W. The dishwasher is full so I have started an ECO cycle. When the main wash starts, with a demand higher than our PV generation, I'll watch for the house to start importing, and the Enphase battery light to go to blue pulsing to show that it is discharging to try to minimise imports. The battery is charging nicely in the morning (from ~6am / 05:00Z), briefly switching to discharge as I make a cuppa, with the 3kW kettle demanding more than the available ~1.25kW of PV! Full (solid green indicator LED) by ~1pm (12:00Z). Overnight I'll see if the gross grid flow as seen by the Loop meter drops from its customary 80--90W. This may not work if the battery is too depleted to cover the load. It seems that the house was powered from the battery for at least the early part of the evening (TV, lights, etc). The Loop meter also saw a reduced (but not zero) load up to at least midnight, ~20W lower than usually reported. (None of the residual may be real... An interesting symptom is that electricity readings are coming in very infreqently, possibly not even hourly, indicating very little flow to power the Loop sensor transmitter, presumably taken parasitically.) The battery was empty before ~3am. 2018/08/08: I now have access to the Enlighten service. The very first "Recent Consumption" data sample that I have downloaded confirms the night consumption rate to be somewhere under 20W. This suggests that the 'other' ~60W that Loop was seeing was indeed false. Phew, fewer vampires than I'd feared! At the moment I'm not seeing generation or grid/battery flow figures in this interface. There are various interesting graphical presentations of the data available. I can clearly see 0.8kWh being used by the dishwasher overnight for example, though had to tot up manually the Wh figures per 15 minutes. Production W: -2.562 (ie some small back feed for meters, etc)? The minimum supported load does not appear to be exactly 5W, but seems to wander a bit between under ~5W and up to ~15W. The Enphase seems to correctly avoid making any exports. I've managed to connect to the same page(s) on the Envoy via the local LAN: I'll have to pin its IP address down if I am going to poll it automagically and reliably from the RPi. 2018/08/09: the installer switched on the features needed for me to see all the data, visible in this screenshot. See the dishwasher running the ECO program starting ~1am. See the Enlighten public view of this system. 2018/08/11: a day where we were mostly away and so loads were small (~2.2kWh) and only ~0.2kWh was imported. Without the battery maybe 0.5kW+ would have been imported. 2018/08/15 07:15: PV has just started to generate and stats so far from the Web interface are 40Wh PV generation, 590Wh consumption, ~130Wh imported. So 3/4s of night imports (after midnight) avoided, hurrah! 2018/08/15 08:30: just confirmed that the rather bright status light on the battery module cannot be turned off or down in software, so I may cover ours physically! It seems that figures in the Enlighten on-line view may be revised several days after the event. Consumption figures for the 16th and 17th were significantly reduced by today (from ~1.7kWh to ~1.4kWh). 2018/08/20: the Envoy has wandered off again to get a new IP address. I suspect my router rather than the Envoy itself. 2018/09/08: the 'net energy' report for August still seems to be being tweaked restropectively. Interestingly battery charging from the 6th is recorded at ~26kWh, with discharge at ~21kWh. The latter represents avoided imports. The difference is mainly the self-consumption of the battery itself and losses (not including the Envoy), so ~0.2kWh/d (8--9W). So an effective round-trip efficiency of ~80%. Though that is a little unfair since the battery arrived charged to ~25% and was nearer 50% at midnight on 31st August, so maybe 81% efficient overall! 2018/09/09: today I am running the weekly 'hot' maintenance wash for our dishwasher. The sky has been quite overcast, so guessing a good time to run the dishwasher was tricky, to cover the water heating (>2kWh) parts. Indeed, it was unlikely that I could find any start time when all the consumption would be covered by PV generation. Indeed, as clouds were passing the house was switching between exporting and importing, and here the Enphase provides twice the smoothing effect to the grid than its nameplate rating suggests. As the battery is not full, it absorbs ~260W of any potential exports, then reduces any imports as a cloud passes by (up to) the same amount. For 2018/08/29 with much less off-grid primary-array generation than the previous day, the 'dump' load was kept off grid a little longer after midnight. ~80Wh was displaced from exports to overnight. Note that over the last few days with us away, so minimal load (not massively higher than the battery capacity ~1.6kWh/d vs 1.1kWh) and significant excess (though variable) PV generation each day, the battery is performing will with ~90% self consumption rather than ~50% for the matching period last year. 2018/08/31: caught the Envoy dropping off the network (top LED is red). Network itself including WiFi is fine. In this case powering off and on the WiFi extender seemed to let the Envoy reconnect immediately, before the extender had finished rebooting... The Enlighten Web interface then showed the 'missing' ~50 minutes' data very quickly also. The new 's' off-grid code (don't dump if the battery isn't full and the house is exporting/spilling to grid) seems to have helped the battery get to FULL twice in quick succession, even with less than stellar insolation, which is an unexpected bonus. 2018/09/09: since fixing the IP address that my router hands out to the Envoy (based on its MAC address) other than one glitch likely caused by the WiFi extender, there have not been any further drop-outs. The WiFi extender is now powered off also, saving some juice! 2019/02/23: probably for about the first time this year, with some sunshine yesterday and low demand overnight with the rest of the family away, the house coasted without fully discharging storage by this morning. Therefore we were effectively off-grid most of yesterday and so far today. Self-consumption, ie (Net - Import) / Net, where Net consumption = Import - Export + Generation, rose from 48% in August 2017 to 72% in August 2018 (~0.5kWh/d reduced imports). The Enphase was only installed on the 6th, and August is a special low-consumption case. September 2018 roughly halved daily imports compared to September 2017 (1.6kWh/d vs 3.2kWh/h), with self-consumption up to 69% from 37%. Some behaviour change and better PV generation may have helped. One aspiration with this kit was to adjust the charge/discharge conditions, eg to match a dynamic ToU tariff or live carbon intensity. While disappointing it is not entirely astonishing, And it is probably positive from a security point of view, for now. 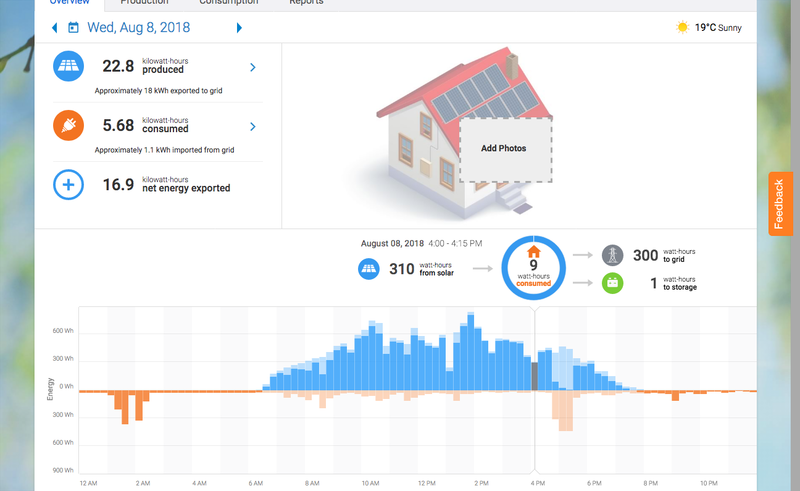 5-minute and daily Enphase data. 2019/02/01: DIY Enphase Trina system Fieldines thread including (positive) Enphase 'review'. 2018/08/01: Enphase within striking distance of profitability in Q2 results: "The company has brought its operating margin to below -1%, as it fends off component shortages, short sellers and potential tariffs." 2015: Tesla Powerwall vs. Enphase AC Battery. I am hoping that this Enphase AC combiner box video, which shows two PV production wires apparently passing though one production CT (Current Transformer), indicates that having my two separate generation meters will not be a problem. 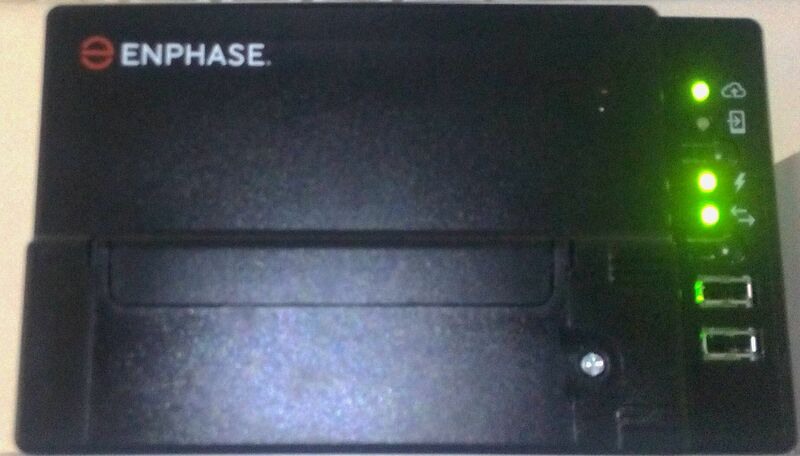 Introducing the Enphase AC Battery: including screenshots and discharge graphs suggesting handling loads well under 100W. Should you buy a battery and how do you choose the right one?. Enphase storage sizing tool: it is suggesting 1 or 2 (1.2kWh) batteries for 16WW with daytime consumption, rising to 3 with night loads/use and optimising for maximum self-consumption rather than cash. The night-loads scenario prediction of ~28% self-consumption without storage accords fairly closely with 16WW observations. See simple capture script and note possibilities from wget -q -O - http://IP.addr/production.json | python3 -c "import sys, json; data=json.load(sys.stdin); print(data['storage']['wNow']);" and Parsing values from a JSON file?. Example Envoy S + 2 x AC Battery installation. 5 Reasons to Consider Enphase AC Batteries (Modular Battery System) Over LG or Tesla including example of mixed Enphase and LG system. Also note in comments: "Enphase originally annouced these batteries in a two inverter (peak load focused model) and a one inverter (baseload targeted model) at a price point in Australia for first adopters of $1,150. The peak load model never arrived and the launch price model was closer to $2,500 installed." " ... the readings here under production are made with an actual CT off the panels. The readings under NET are made with a pair of CTs on the full house wiring (includes production and consumption). The readings under "TOTAL CONSUMPTION" are derived from the other two sets of readings." On 2011/01/10 400Ah@12V of lead-acid gel cost me £900 including VAT and delivery, ie close to £400 per usable kWh of storage, and at 120kg gives an effective energy density of ~16Wh/kg. Page Media: image, alternate, alternate, alternate, alternate(i/src). First published 2018-07-25 , updated 2019-04-17 , rebuilt 2019-04-19 . Site copyright © 2007-2019 Damon Hart-Davis. Hosted by ExNet.